Mozzarella stuffed meatballs in a delicious flavour packed tomato sauce. 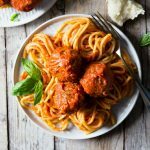 This recipe is so easy and absolutely delicious, juicy meatballs stuffed with oozing mozzarella cheese and cooked in the easiest tomato sauce. Add all the meatball ingredients to a large mixing bowl apart from the mozzarella. Using your hands mix everything together without squeezing too tightly. Once everything is combined thoroughly shape a rough meatball using the palm of your hands. Once you have a meatball shape, make an indent in the middle of the ball using your finger. Place a cube of mozzarella in the hole and seal it back up. Roll the meatball between the palms of your hands again until shiny and smooth. Repeat the with all the meat mixture and mozzarella until the meat has been used up (you should have 12 large meatballs). Place them in the fridge for 10 minutes to firm up. Add a small amount of olive oil to a large pan and brown the meatballs on all sides. The should have a nice, crispy coating on the outside. Remove them from the pan and set aside on a plate. Next, make the sauce, add the canned, peeled plum tomatoes to a blender and blitz until smooth. Add a little more olive oil to the same pan you cooked the meatballs in and add the chopped garlic, saute for a few seconds then add the tomatoes. Add sugar, balsamic vinegar, salt and pepper to the sauce and let it simmer on a low heat for 5 minutes. Add the meatballs and simmer uncovered for another 30 minutes. Serve with spaghetti or salad. Use whole peeled, canned tomatoes instead of chopped or crushed. Whole tomatoes have much less water in them and much more flavour, these are the best for pasta sauces. You probably won't use the whole ball of mozzarella. If you have any leftover try tossing it over the meatballs at the end and cover with a lid for a few seconds until the mozzarella melts over them. Alternatively, keep it covered in the fridge to add to salads.